How are SLMP Issues are Addressed in Other Places? I submitted this comment with respect to the SLMP review and wanted to post it here. My top level comment on the SLMP review is that it should set balance as it’s prime directive, balancing human use and ecological integrity in the context of climate change. I use the term ecological integrity because as climate change impacts the region, we need a mindset that goes beyond protection and preservation. The forest in 50 years is not likely to be the same as today regardless of efforts we may make. Preserving the forest as is will be beyond our control. Climate change is a global phenomena , and you would have to assume successful global response regimes to believe ‘preservation’ is even possible. Protection will have a different meaning. So those words will not serve us well in the coming decades. Thinking we can expect the forest to be stable is not remotely realistic. I recognize this is not the same as protection and preservation, language in place now. In the 1970s, no one used a term like ‘ecological integrity’. At times, it will mean less recreation. At times it will mean better science and active interventions for the health of the Forest Preserve. It may mean we work to become hosts to greater number of species at migrations develop. We Adirondackers love to think of ourselves as a model, and deservedly so. But there is nothing like getting out of the area to see fresh, unencumbered, views of how to manage large scale tracts of public land. The SLMP review would benefit enormously from a modest effort to see how other protected places handle similar tasks. It could be done at a College in the region, by APA staff, one of the NGOs or a volunteer. But, short of that, I can tease you with some observations. Our travels have taken us to a few other places where there are similar issues with respect to managing large areas of public land. But I was there on vacation, not to study their land classification systems. Still, I enquired when I could so here are a fee ideas to share. In the 1970s Costa Rica set up a system of reserves that now cover about 25% of nation. Since then they built an entire eco-tourism industry, complete with hotels, community colleges and university level workforce training, all sorts of guide services, appropriate excursions and attractions. Relative to the Adirondacks, the most striking feature of their public land management is a “no hunting” policy. It is not allowed. Even in the case of animals that are causing problems in communities (typically crocodiles) they capture them and move them to a different, safe, location. Guided walks are common and popular. They typically use trails that are very well maintained and heavily used, but they only cover a small fraction of a tract of land, the vast majority of which is left undisturbed. In one area, a white water river, tour operators have camps where guests can stay for one night for a break from the river. Private lands have been set up similarly, as reserves with a small portion developed with trails and guides. So, my observation is that tourism is a big industry, but usage is concentrated in small portions of protected areas and visitors are often in the company of a paid guide. The guides are highly trained and it is a respected career that young people seek out. We visited a Park in southern Chile called Torres del Paine. It is a spectacular, vast and very remote place, several hours drive from anywhere. There are a handful of in-holdings that were originally ranches but are now a few hotels across a range of price points. The landscape is very different from the Adirondacks. Rolling hills surrounding enormous granite towers, an ice cap, glaciers and so on. One wilderness is 600,000 acres, located right next to another one of similar size. Much of it is classified “wilderness’ and what that means is it’s off-limits. No one can go there, just like we keep people out of public drinking watersheds here. They do issue occasional permits for science expeditions and the like. Within the wilderness areas, they establish what they call ‘human use corridors’. In these areas there are trails and a handful of locations where you can camp. Most camping is in a controlled area where tents are set up for the season by the Park or a concession operator. You reserve tent space in advance, the number of spaces is limited. You do not need to bring a tent. Options for people with their own tents exist but are limited. The general rule is that people cannot wander off-trail, so, no bushwacking in our local terms. Guides are very common, and often included in hotel packages. They post a list of trips you can join each morning from each hotel. You can go on your own, but most people don’t. They make a big point about back country rescues: there is no rescue outside the human use corridors. There is no hospital to take people to anywhere nearby. The point is be careful, don’t do anything stupid, because there is no real rescue help to save you. There is no cell service, of course. These rules sound severe and they are. Mostly they are the result of bad forest fires, attributed to campers burning toilet paper. There are small signs around saying ‘please don’t burn your toilet paper’. It gives a whole new meaning to leave no trace and carry it out. We recently returned from a trip to Italy that included visiting a Park in that stretches from the Appinine Mountains to the sea in an area called Cinque Terre. The administrators of this park visited the Adirondacks last year; they have an exchange program with Paul Smith’s College. So we visited their Park and got to see their situation. The two regions of their Park are vastly different. Cinque Terre is small, by the sea, and crowding of their postcard-perfect towns is their problem. But the mountains, only 60-90 minutes away, area largely vacant with numerous mostly abandoned old villages in the hills. We stayed in one, called Apella. We were chatting about our town (Keene) and they asked how many people live here. We said about 1200. Their population is 9. Clearly they have a different depopulation problem. So, what they are doing, is remodeling the old houses in each village, one-by-one, slowly making each little village into a modest hotel (think B&B scale). It is run by a brother and sister, with their father helping out. And it is working. We arrived and there was a big Italian wedding in progress. They have great environmental protection, but the place is dying economically. So when they use the word ‘sustainable’, they are talking about survival of these tiny towns. Agri-tourism is their response and it appears to be working, slowly. They do have a simple land classification scheme. Zone A. Zone B. and Zone C. Zone A are especially sensitive areas. People are not allowed to visit there; if it is a water area, boats are not allowed. Zone B areas surround Zone A and are intended to be buffer zones. People can visit these areas, but only with guides that know the rules. Zone C areas are generally accessible with the typical set of rules for a protected landscape. The beauty of this for us, as visitors, is that is it easy to understand, which is important in an area with international visitors. I wish these were more than anecdotes. When our SLMP was written, there were no models to examine. Ecology was a new science. For the most part, it has been great. But in the decades that have passed since, protected areas have been set up all over the world with various classification and management schemes. Ecological science has developed dramatically. I am assuming this SLMP review will have 2 phases. First, there are two issues that arise from the Finch land acquisition that need to be sorted out. I imagine this can be done fairly quickly and should not be hugely complicated. I think bikes are fine in appropriate areas, like old logging roads all over the Park. I have no issue with a metal bridge, but a wood one, if costs were equal, would look nicer. It is not a big deal. But the second phase should be a broad, open, review of our land classification scheme. What models have been used in other parts of the world? Can we learn anything useful from their efforts? We like to think there is no where else like our place. But other numerous protected places have established world wide since the 1970s, each with management and classification schemes. Surely a review of how other places have handled similar tasks would bring some perspective and learning to our SLMP review that simply was impossible decades ago. We should be open minded and embrace the learning opportunity. For small effort, we can leverage the work in the rest of the world. This entry was posted in Conservation, Implementation Planning, Regulation on October 27, 2014 by ADKfutures. Even though the main thrust of the ADK Futures project has moved on to implementation and tracking progress toward the vision, we continue to give talks where we introduce new groups to the original six scenarios and the issues that they frame for the Park. There are plenty of people that have not heard them yet and there is always a good discussion. Recently we gave a talk at the Adirondack Museum in Blue Mountain Lake. About 40 attended and we had an excellent discussion about the scenarios. In the middle of our talk, after we presented the endstates, we asked them to do the ranking exercise for desirability and attainability. The results from 31 people turned out to line up very well with the overall results from the workshop series as you can see in the table below. The ranking on desirability is almost identical to the workshop series. 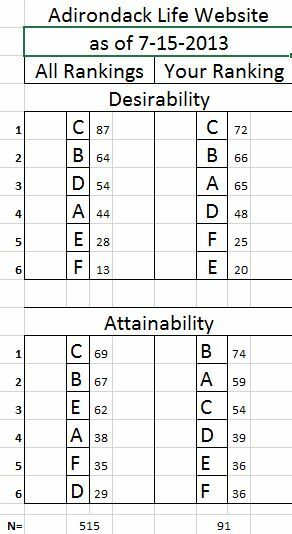 The attainablity rankings were slightly different, putting the Usable Park (B) first instead of Sustainable Life (C). Also, surprisingly, the Adirondack County (D) endstate was seen as more attainable than in the averages but thinking of the Park as a region is much more widely talked about now than it was. In addition, we published a condensed version of the six endstates in Adirondack Life this spring with a link to the magazine’s website where readers could do the ranking exercise. Although hundreds of people started the exercise, only 91 completed it. These rankings are shown in the table below. C and B are still the top in desirability. But the Wild Park (A) ranks third instead of fourth with this group. Also Adirondack State Forest (F) got a slightly higher score and is fifth instead of sixth. 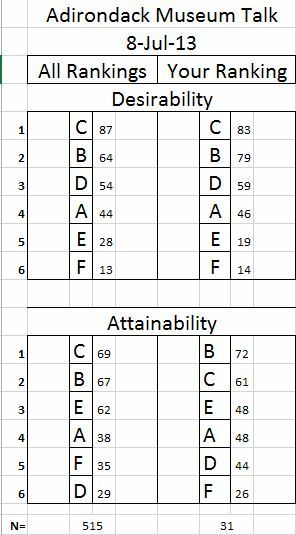 The attainability ratings are very different with Sustainable Life (C) is only third. Wild Park (A) again ranks higher than in the workshop series. These results are similar to those of two half-day workshops we did during 2012. One was with a group of seasonal residents. The other was a group of Paul Smith students in a land use planning class. The Wild Park scenario was an attempt to capture the point of view of a person who doesn’t live in the Park and is not involved in the issues of economy and community building in the region. These two data sets overall continue to support the consensus vision that is based on the Sustainable Life (C), with a sustainable version of the Usable Park (B), and continued protection of the Forest Preserve as a Wild Park (A). This entry was posted in Community Development, Conservation, Economic Development, Local Government, Regulation, Uncategorized on July 16, 2013 by ADKfutures.